At 12:44am this morning I was walking home from work and I decided that today I had earned a day in the sun with a friend I hadn't seen since last summer. That friend.... Sangria!! !We have all had it, and I would guess that most of us like it. I love it. I guess it just reminds me of good memories! Being with friends, bbq's at my mom's old place in Orlando, and of course tapas!! Today I just wanted to be in the sun and have a drink that would not leave the rest of my day a wash! 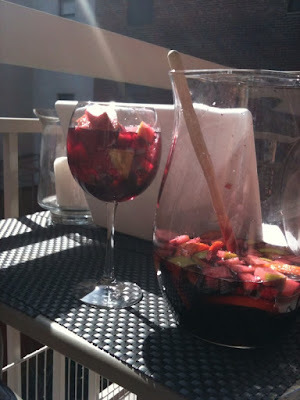 So sangria it is!! Hello old friend!! I decided to find out what "sangria" means. Turns out it means bloody. YUM! As gross as it is, we have all read or at least seen "The DaVinci Code" so it should not be a shocker! Next I decided I would figure out where I have had the best sangria, and hands down it was at Yerba Buena in Manhattan. If you haven't checked them out, do so. The food was ok, but the "brunch punch" as my friend Anthony puts it was AMAZING!! !